Rick’s answer: Brittney, as luck would have it there is a very inexpensive and effective solution to your problem. 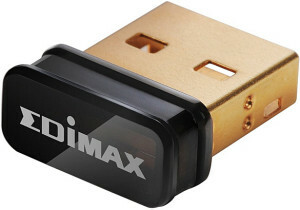 All you need to do is buy a USB Wi-FI Adapter and simply plug it into an open USB port on your PC. There are tons of them to choose from on Amazon, and they don’t cost much at all. In fact, as of this writing you can pick up the best selling USB Wi-FI Adapter on Amazon for around $10. You’ll be hard-pressed to get by much cheaper than that! It’s the Edimax EW-7811Un, and I love it. You can check it out right here. There are a couple of other options for connecting your PC to your Wi-Fi network, but since you asked for the cheapest way possible I won’t go into them in this post. I hope this helps Brittney. Good luck! Bonus tip #1: This post explains how to convert any USB printer into a wireless Wi-Fi printer.